Drive a new 2014 Toyota Corolla and you opinion about constantly variable transmissions (CVTs) will change. When CVTs first appeared they were met with the disdain of all auto enthusiasts. Their drone, feeling of slip, and odd RPM placement given whatever type of driving one was doing, made us all feel very uncomfortable driving one. With the new Corolla, that is now a thing of the past. At a recent media launch of the 2014 Corolla the product manager spoke in detail about the new CVT and the promises seemed over-hyped, but proved true once we drove the cars Let’s jump right to what the new car feels like when driven. Upon starting off from a stop one notices nothing unusual. The CVT, which Toyota calls Constantly Variable Transmission – intelligent Shift, or CVTi-S, runs up the RPMs to whatever is appropriate for your desired rate of acceleration. Let’s say 3,000 RPMs. At that point the car “shifts” and the RPMs drop back down, and resume their climb up. If you have room to continue accelerating this will happen up to 7 times according to Toyota, mimicking an 8 speed transmission. In actual practice around town, you usually only feel two or three such “shifts” before your speed levels off. At that point you forget the transmission and it does nothing unusual. Before we bash Nissan, let us thank the company; Thank you Nissan, for going first and being bold enough to put a CVT into almost everything including the Maxima. Had Nissan not had the cajones to jump into CVTs with both feet they would still be relegated to weird micro-cars, ultra-economy cars – and almost all hybrids. Nissan was the first major automaker to say, “Screw it, the gas mileage savings are too big to ignore,” and put a CVT in almost all its cars and crossovers. Fair enough. Now let’s bash Nissan. Many people feel as if the Nissan CVT groans and moans and feels like it is slipping all the time. At our event a journalist had just come from a Nissan vehicle test drive. He said the new Nissan he drove still felt this way. In fairness, we went to a Honda event recently and many non-writers in attendance, it being a public event, did not realize that the Honda Accord and Nissan Altima they drove had a CVT. So not everyone even cares. Many do. 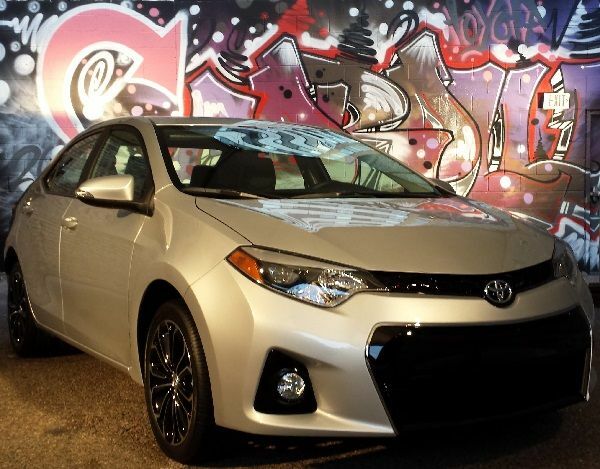 The new CVTi-S in the 2014 Corolla is not just a CVT that mimics shifting to make you like it. You will also like it because, according to Toyota it added about 2.85 MPG to the Corolla. That is simply amazing. Almost a 10% gain in fuel economy. There are very few tricks like this left to employ. The end result is that a bunch of the Corollas get 40 MPG highway, and one special model gets 42 MPG. That is dead in the middle of hybrid territory and this car is not a hybrid. Hybrids almost always use CVTs, so it is starting to be clear that hybrid-style fuel saving tricks are starting to appear even in cars that have no propulsion by electric motors, and the effects are significant. The 2014 Corolla’s CVTi-S also has some nifty tricks. If you buy an S model, it can come with paddle shifters. When you use them, they work just like the paddle shifters on all other Toyota and Lexus cars. That is to say, very well. Corollas have only 132 horsepower, so after the initial fun of experimenting with them you will grow bored. However, they are nice to have. We won’t dive too deep on the Corolla in general now (see our other stories this week), but if you think of this car as entry level and not fun to drive, you are in for a very pleasant surprise if you test drive one. The CVTi-S has two added modes. In S, for Sport, it mimics a sporty transmission with 8 speeds (or seven depending on how you look at first gear). The CVTi-S will hold revs, “downshift” if you decelerate to a corner, and it will hold the RPMs in a higher range as if it were a sports sedan. It works as advertised. There is also a B, for Brake, button. In that mode it will use the transmission to decelerate the car via engine braking. Helpful for mountain roads, and other situations where having the car use the engine to drag on the car to let the brakes take a break is desirable. We doubt it will get much use, but there it is if you want it. Toyota is making some promises about this new CVTi-S and from our time in the car it seems that they are all factual, but more importantly, you will actually notice the positive improvements the company is claiming. In summary, this writer is an enthusiast who enjoys a stick shift. However, for a variety of reasons I have become a fan of paddle-shift automatics. Corolla now offers all the benefits of that, plus the benefits of a “normal” torque converter transmission, plus the benefit of a CVT (that being improved mileage). What’s not to like? Oh, by the way, the Corolla L and Corolla S can also come with a 6-speed stick shift. So if you are that guy that always writes in and says only stick shifts are cool, you can love a Corolla now too. We hope you will still write though. Photo by John Goreham. Original art work in back by Shades.